French biochemist who shared with his fellow researchers the 1965 Nobel Prize for Physiology or Medicine. They revealed how messenger ribonucleic acid (mRNA) is involved in protein synthesis within a cell. He headed the Pasteur Institute from 1971. In Monot and Wainhouse (trans. ), Chance and Necessity (1972). Whereas modern man's present form goes back about two million years, and can be traced further back along the hominid family tree, say, up to 20 million years more, man still carries an inheritance from the first origin of life two thousand million years ago. 1 Jacques Monod and Austryn Wainhouse (trans. ), Chance and Necessity: An Essay on the Natural Philosophy of Modern Biology (1972), 160. 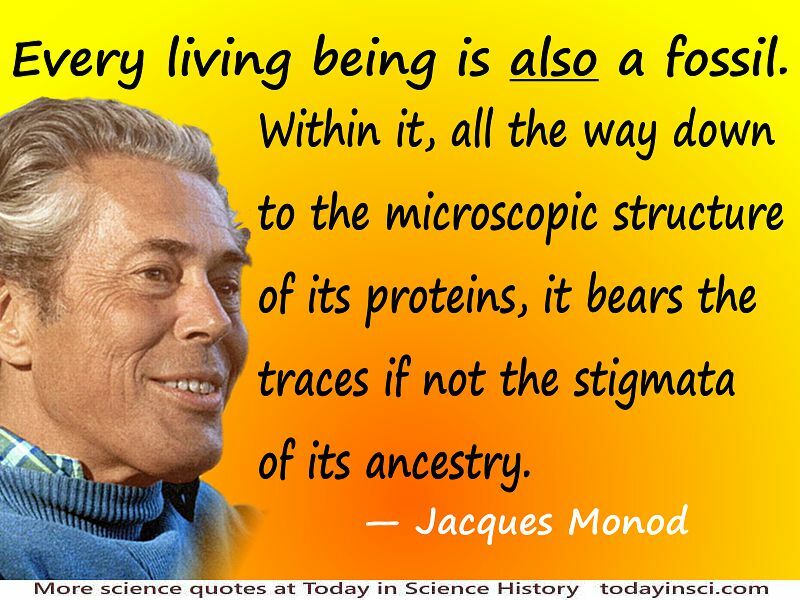 Science Quotes by Jacques Monod. 9 Feb - short biography, births, deaths and events on date of Monod's birth. Origins of Molecular Biology: A Tribute to Jacques Monod, by Agnes Ullmann (ed.). - book suggestion.